I love this cake and have made it for many birthdays. The Cream Cheese Frosting is rich, but not too sweet, and the cake looks really nice with chopped walnuts pressed into the sides. Make it in layers for a birthday or in a 9×13 pan for a potluck. If you like heavily frosted layer cakes, make an extra half batch of the cream cheese frosting. Sift together flour, salt, soda, and cinnamon. Set aside. In the stand mixer bowl, mix the sugar, oil, and eggs for 2 minutes, scraping sides of bowl often. Gradually add the flour mixture and beat at low speed for 1 minute. Stir in carrots and nuts until well mixed. Pour batter into prepared pans and bake for 55-65 minutes. Remove from oven and allow cake to cool in pans for 10 minutes. Remove from pans and cool completely on wire racks. When cake has cooled, spread cream cheese frosting between layers, along sides, and on top. Sprinkle chopped walnuts on top or press them into the sides of the cake. Store cake in the refrigerator. Prep Time includes making the frosting and assembling the cake. I often make the cake the evening before I need it, then frost it the next day. 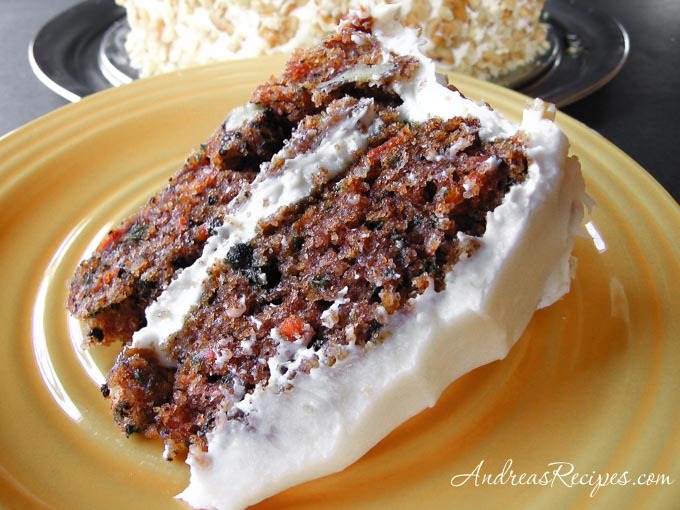 Hi– Regarding your carrot cake recipe– is baking time the same for a 9″ x13″ as the layers? Looks great! I bake three pans of cake to get the maximum amount of frosting. My version of the frosting with more sugar is stiffer in appearance.